FRANCE SAID TODAY it would submit a resolution to the UN Security Council calling on Syria to put its chemical weapons beyond use or face military action. The resolution, to be presented in New York later today, will also demand that the individuals responsible for an August 21 chemical attack on Damascus suburbs be put on trial at the International Criminal Court, French Foreign Minister Laurent Fabius told a press conference. Fabius said the resolution would demand full disclosure by President Bashar al-Assad’s regime of the scale of its weapons programme, and that the arsenal be placed immediately under international control as a first step towards its being dismantled. The minister said the resolution would be presented under chapter seven of the UN charter, which provides a basis for military action. 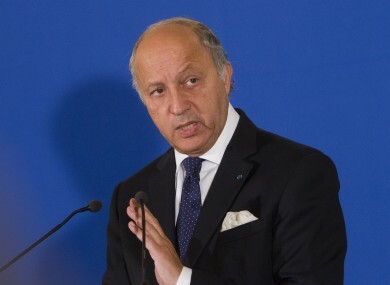 “It will provide for extremely serious consequences in the event of Syria violating its obligations,” Fabius said. The French UN move came a day after Russia presented a proposal for Syria to cede control of its chemical weapons in order to avoid threatened military strikes by the United States and France. Later today, US President Barack Obama is due to address Americans on his progress in getting support for a military strike on Syria. Email “France to submit resolution on Syria chemical weapons to UN ”. Feedback on “France to submit resolution on Syria chemical weapons to UN ”.